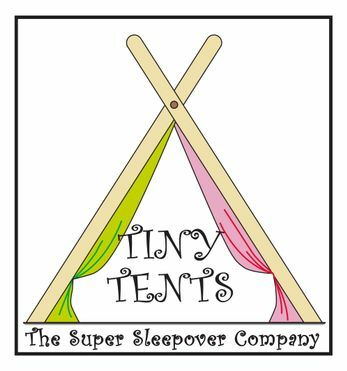 From the moment I contacted Tiny Tents, their service was impeccable. Their response time to questions and to organising delivery and collection were fantastic. When the tents were delivered with all of their coordinating accessories I was really impressed with the quality. Someone has spent a long time making sure that everything matches perfectly - a real eye for detail. I enjoyed setting up the tents are was very pleased with the overall effect and the response from my daughter was magical. Thank you Tiny Tents! We used tiny tents for my daughter's 10th birthday party and it was fabulous from start to finish. very accommodating to all our needs and the girls loved it. the tents are fantastic and added fairy lights and pillows gave that extra bit of sparkle and magic to the evening. packages also aren't too costly and the smile on my little ones face justified every penny! Thank you for a fantastic party!!! I called Tiny tents for my daughters 9th birthday to be told they don’t cover my area- but Hayley is so great that she found a way to do it for me Tiny tents were friendly, most helpful, and totally reliable My daughter and her friends had the most amazing time and I was so chuffed to be the ‘best mum and auntie’ in the world! Thank you so much Hayley and Ollie- you were superstars and I would highly recommend Tiny Tents to anyone! Thank u so much Hayley and Ollie!!!! My daughter and her friends had a fab sleepover party!!!! The excitement level was well above 10!!!!! Hayley was so accommodating and efficient with txts and phone calls when booking the party. Ollie delivered and collected it all with friendly advice. The girls parents want me to organise one for the adults but think we may need bigger tents. � Hayley and Ollie you were both a pleasure to liaise with and I will certainly be recommending you to our friends! My 10 year old daughter had a double birthday sleepover weekend in these beautiful themed mermaid tents with 2 groups of friends. All the children absolutey loved these tents and the little extras that came with them. Who knew designing a heart chalk board could occupy them for so long! The quality and attention to detail in all that was provided was fab. However, what was even more impressive was how helpful Hayley & Sadie were coming to my rescue when I was let down by another company at the last minute. Tents had arrived at my house within 12 hours of speaking to them!! You don't get that kind of customer service very often. Thank you to everyone at the company. Would highly recommend! I would highly recommend Tiny Tents for birthday sleepovers or any special occasion. We had such a wonderful experience for my daughters 10th birthday and it will definitely be a birthday she will never forget. The tents were beautifully made and there was fabulous attention to detail with the added accessories. The girls just loved sleeping in their own tent and can't wait for the next sleepover! Thank you so much for making the whole process so easy and stress free. You made my daughters birthday the best one yet! I would just like to thank you so much Lisa! You made my daughters birthday the best one yet!! I have never had a party as amazing !!! I have a very happy bunch of ten year old girls. And I know they will not forget this sleepover for a long time! I would highly recommend tiny tents!!!! The quality all the tents and accessories, just wow!!! Worth every penny. bright light in their childhood! What an amazing experience. I would go so far as to say this is an investment in your child because it becomes a precious memory they will absolutely look back on as a bright light in their childhood! Thank you Lisa for all your efforts, excellent organisational skills and thoughtfulness. We'll definitely do this again and I would recommend it to anyone! My son (11) and Daughter (9) had a fabulous birthday thanks to Tiny Tents. You went out of your way to ensure I had everything needed and for the time I needed it even when you were on holiday. Exceptional customer care, I am truly appreciative of, THANK YOU! Thank you so much Tiny Tents!